I am typing this to the smell of oranges cooking. Every January I make a year’s supply of Seville marmalade, so it must be the new year, with lots to look forward to. I had been lacking a bit of motivation since I broke the 2.5cc British tether car record and the follow up run in Poland at a similar speed but I have now ventured back into the workshop. 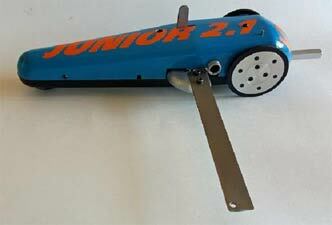 This is a Russian 2.1cc Junior tether car kit produced by Lev Sprints, I collected it in Tallinn last year. It is powered by a Novarossi 12(2.1cc) size engine, the cars are quick capable of over 100mph. It has been suggested it might be a good introduction to tether car racing for seniors as well. It comes with a full set of drawings and instructions in Russian, I have a Google translation of the instructions but as all men do, I will only look at the instructions as a last resort. 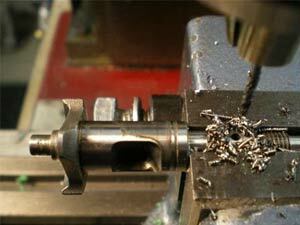 This was the first task, drill a hole for the gear drive pin through the crankshaft. If I could do it the project was on, I bought my Novarossi from Ebay less than £90 so it was worth a try. Filed through the case hardening with a diamond file and then drilled through with a 2mm tungsten carbide drill nice and slow with plenty of lubricant. The pictures are a bit dark, I have put some LED lighting in parts of the workshop, nice and bright, but my camera doesn’t seem able to cope. The lights are a big improvement but take a bit of getting used to and they have a bit of a stroboscopic effect on the machines. The engine and axle mount comes fully machined and predrilled and tapped for the Novarossi and my 2.5cc Picco engine also fits. 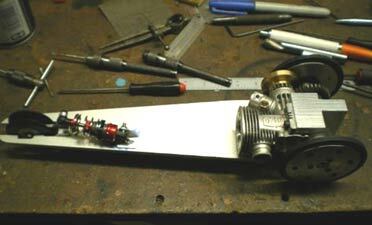 The engine sat a little proud of the bearers so I milled a slot so it fitted. 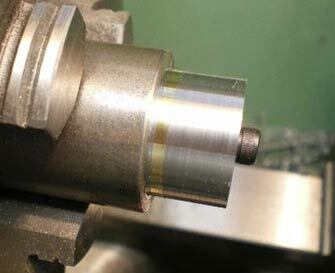 Next job was to press in the bearings for the axle. 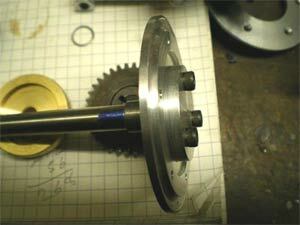 The axle was a very tight fit in the bearing and the diameter had to be reduced a little, the easy way to do it in the lathe with emery paper on a flat strip of metal. With the axle in the bearings wheels and gears fitted something was not right the flywheel was fouling the wheel (you will see I have shortened the crankshaft). After a bit of thought and fiddling about I realised the hole in the axle for the drive pin was in the wrong place, drilled a new hole and made a couple of spacers for each of the axles. 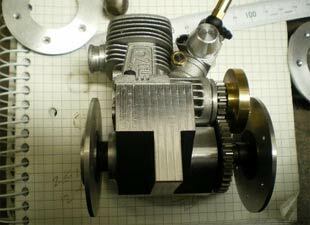 In the picture below is one of the spacers I made and the brass flywheel that needed a small mod so the gear on the crankshaft fitted. The cylinder head about to be modified. 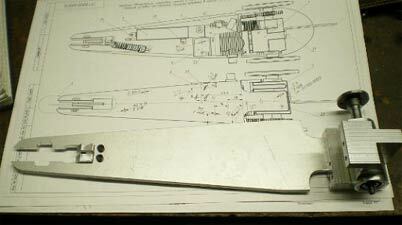 Below is the chassis plate, comes as a blank and needs all the holes and cut outs doing. 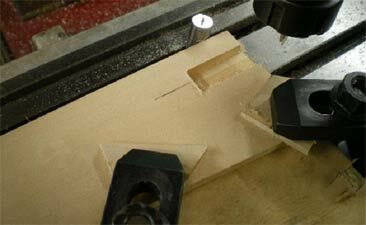 I have cheated and set up on my milling machine and did the lot. This kit is for juniors and it would be made at an engineering "youth club" where they would be learning basic engineering skills and would be done by traditional marking out techniques and files. 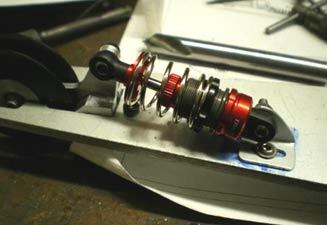 Next month I will continue with the front suspension and shut off. The picture above is what the finished car will look like, to me it’s not pretty. The car on the right is better looking. Plans are afoot to make it look like an American hot rod. Don’t rush out and buy the kit yet unless you want the basic model. 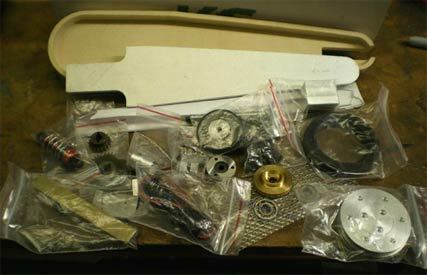 Lev has a website where you can buy the bits separately and build something different using the parts, more to follow. 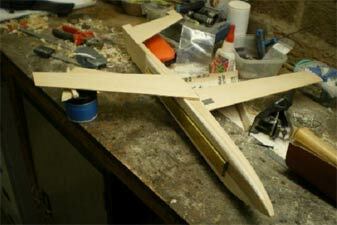 I enjoyed last years pulse jet flying, this is the new model for this year, a new more powerful jet. 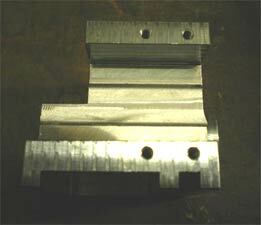 The milling machine has been pressed into action on the aeromodelling side as well. 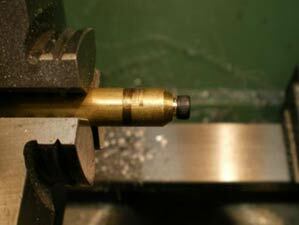 Getting all the flying surfaces and engine lined up correctly is important, the mill makes it a lot easier. The workshop is not the warmest place at the moment but will continue with the junior car. 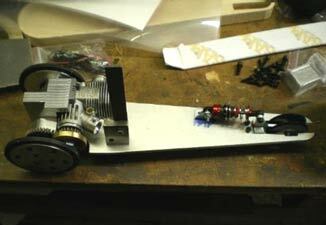 I have to do some work on a new 2.5cc engine I bought in the summer ready for this year racing season. Some new pistons for 1.5,2.5 and 5cc engines to do. And finish the jet model. Not my best work as a photographer. 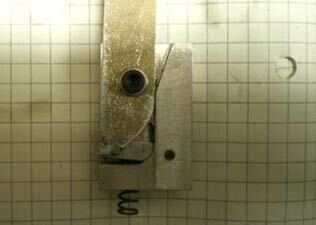 Circlips are not always the easiest things to source but they are easy to make. 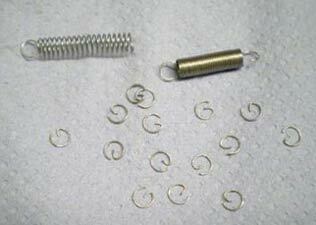 These are for my 5cc engine, you need to find a spring that has the same diameter wire and outside diameter as your existing clips. First step, as the second picture, bend down the tail with long nose pliers then cut off with a sharp pair of wire cutters, then if required, smooth the end of the wire with a diamond file. You won't throw many of them in the bin until you get the hang of it. Back on with the Russian junior car, this is the part for the front suspension. 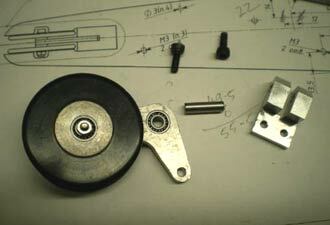 The bearings need fitting to the wheels. 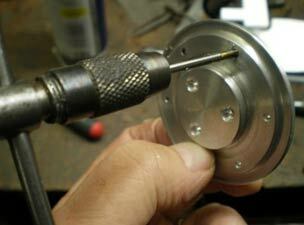 First job was to bore out the holes in the wheels using a jig that I had made for another project. 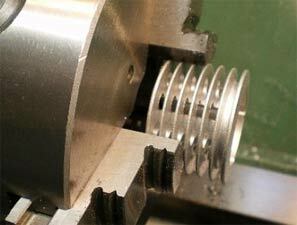 The bearings are a press fit, a bit of Loctite retainer could be used to make sure they stay in place. 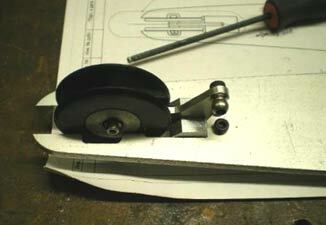 The wheels all assembled and fitted to the chassis plate, I had to make the pin from a bit of silver steel. The front shock absorber fitted, just needed a little bracket making with a slot so that the ride height of the car can be altered. Decided I would put the back wheels on, found that none of the holes had been tapped in wheels. 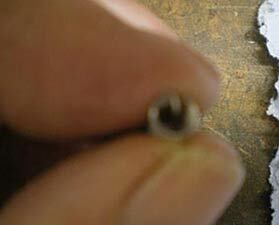 Twelve holes to tap in M2.5, just go steady and use WD 40 as a cutting lubricant and of course sharp taps. The screws to hold the wheel halves are supplied as part of the kit but the heads are too big for the counter bores in the wheel. I took the easy option and turned the heads down to fit. 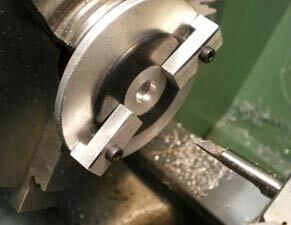 The other option would have been to increase the diameter of the counter bores. The parts for the shut off. No drawing was supplied but you can find an assembly drawing on Lev's website http://bystryi.silnyi.ru/ in the shop part of the site. Google translate is your friend. 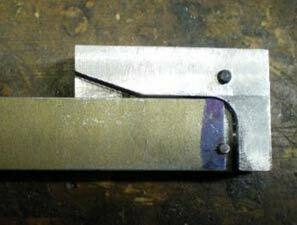 The first operation (right) is to open out the slot on the end of the block with a file, it needs a flat bottom and to be a bit wider. 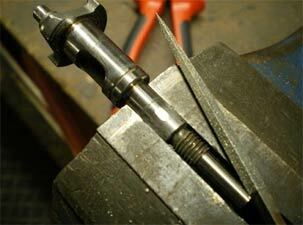 In the left-hand picture, you can see the block in place with the pivot hole drill and a pin fitted. 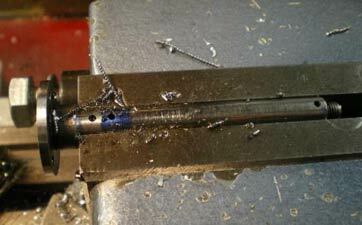 The shut off arm has had a half round filed into it to fit on the pin. 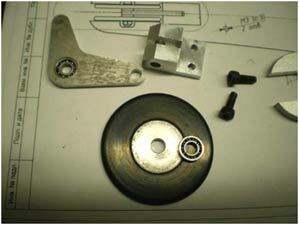 The first picture shows the completed shut off and the second its parts. The shut off action needs to be positive and lock in the open position, so when the car is bumping along the track you don’t want it to go off on its own. 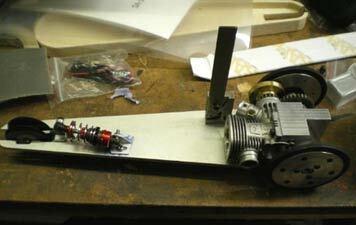 It will feel quite hard to operate but that is what it needs, the brush on the track will shut the car off, no problem. The curved part of the arm just needs to be smooth enough to reset it. Here’s the shut off fitted to the car and inline with the needle valve. 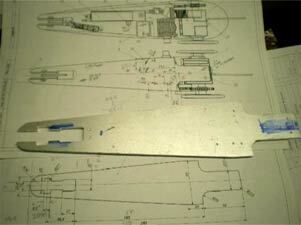 The arm will just need cutting to the right length when the body is fitted. I really didn’t like the body style of the original car and I won’t make it as a junior anymore. 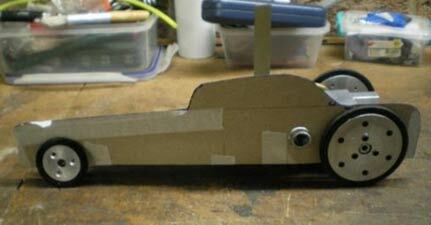 I have done some 'CAD work', cardboard aided design, and done a hot rod styled car. 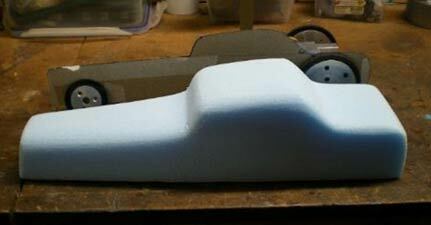 The blue foam plug is ready and the glass will get laid up when it gets a bit warmer. Next time should see some revised front suspension, the modification of the needle valve, perhaps the tank and the new top. 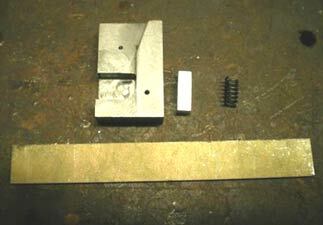 Just a recap on how to make shims for the head or liner. 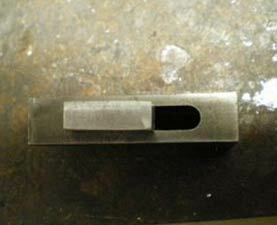 Cut out squares of brass shim various thickness' a bit bigger than the OD of the shim required. 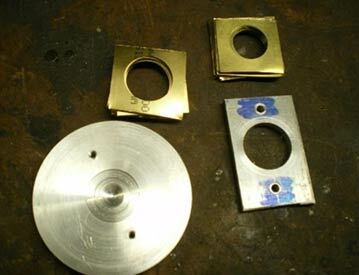 (KS do a small pack of various sized shim brass). 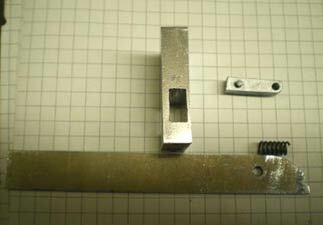 I just use some scrap aluminium and bolt the brass squares under a metal plate, then drill and bore to size, plus a bit, liner bores vary in size. 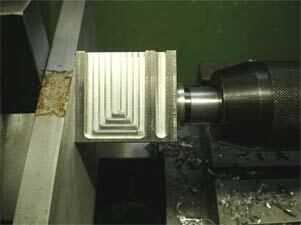 The second picture shows the machining of the OD, make a mandrel that is bigger than the OD of the shims, then turn a spigot on it to fit the shims ID. You can then use the clamping plate to hold the shims in place, just saw off the excess material, tap the end of the mandrel and use a big washer to hold it all in place. 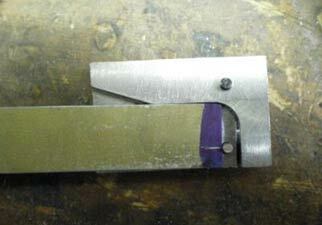 Then turn to the required OD, you will have bits of shim sticking out but it turns no problem. That’s it for this month, more next time, not sure what yet but I know I have some pistons to make and three unfinished cars. The jet, with luck, should have flown by then, weather permitting.